The Christmas cookie is as traditional as decorated trees, elegant carols, and holiday cards. A symbol of the sweetness and innocence of the season, holiday cookies are decadent treats suitable for formal, casual, and family gatherings of all sizes. What Makes a Cookie a Christmas Cookie? Exclusivity. A cookie for Christmas must be made only during the holiday season, thereby strengthening its sentimental and nostalgic value associated with the holiday. Whether it is made in advance of the season and stored for celebrations or made as part of an annual tradition, a true holiday cookie is exclusive to the holiday season. Decoration. The holiday season is one of elaborate decorations, from intricate trees to exorbitant yard displays to the fine detail on a single ornament. Cookies for the holiday season are decorated as well, either by taking extra care so their preparation comes out picture perfect, or more frequently through elaborate icing and sprinkles with holiday colors and themes. Within those two wide parameters, there are many variations of the classic Christmas cookie. Which cookie is most nostalgic for a particular family depends on their personal traditions and preferences, and many families invent new traditions and embrace new cookie recipes as years pass and tastes change. 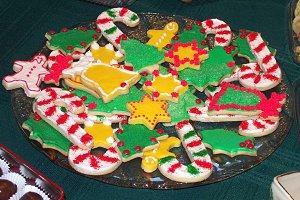 Sugar Cookies: Often shaped like holiday icons (snowmen, reindeer, trees, stockings, etc.) and elaborately decorated, the soft, sweet taste of a sugar cookie brings back holiday memories for many families. Gingerbread People: Cookies shaped like men, women, and children made from this spicy dough are a rich holiday tradition for many people. Decorating gingerbread cookies may be as simple as adding a face and buttons, or as elaborate as intricate details making each one a miniature masterpiece. Mint Cookies: Peppermint is traditionally associated with Christmas, and cookies that incorporate this tangy taste are often a holiday favorite. Chocolate mint, vanilla mint, or other varieties decorated with mint candy pieces are all part of the holiday spirit. Gourmet Cookies: Any elaborate recipe that takes hours to prepare has the potential to become a treasured holiday treat because it is unlikely to be baked frequently. Every family has its own variations of gourmet cookies suitable for Christmas goodies. Stained Glass Cookies: These shortbread or sugar cookies with interior cutouts lined with melted “glass” candy are a beautiful addition to any holiday table. Stars and other geometric shapes are the most common designs, though any cutout is reminiscent of the beauty of the season. Bakery Cookies: Many families who may not have the time to bake elaborate recipes turn to seasonal treats from local or international bakeries as a once-a-year indulgence. These cookies come in many flavors and quickly become a much-anticipated holiday tradition. 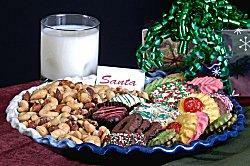 Leaving cookies for Santa Claus is a long-standing Christmas Eve tradition for children throughout the world. While the precise origins of this tradition are unknown, it may be related to the idea that children who have struggled to be on Santa’s “nice” list all year are seeking to sweeten his disposition. At the same time, the largess of sharing cookies embodies the spirit of generosity so vital to the holiday season, and parents around the world sneak a late night snack so their children can delight in the few remaining crumbs on the plate the next morning. Decorating Christmas cookies as a family, perhaps on Christmas Eve or while watching a classic holiday movie. Baking large numbers of cookies to share with neighbors, friends, and other individuals to let them know they are an important part of the holiday season. Choosing a new recipe to incorporate into each year’s celebration. Refusing to indulge in the smallest taste until Christmas Eve or Christmas Day, thereby making the treats even more exclusive. Whether a family bakes one Christmas cookie recipe, a dozen different recipes, or simply chooses nostalgic treats from local bakers or catalogs, holiday cookies are a sweet and tasty tradition in many families, with more layers of significance than any icing can symbolize.To find a wide selection of Christmas cookie recipes, check out LoveToKnow Recipes. Check out LoveToKnow's The Best site for a listing of The Best Christmas Cookie Recipes.